Amethyst the purple variety of quartz is a gem that has found universal acceptance. However when the gemstone first came to light in ancient times, it was reserved for the royals and wealthy - historians say that it was often priced on par with rubies, sapphires and even diamonds. Those were the days when Brazil was not known to be a major player in the supply of this gorgeous purple gemstone. The mountains of Russia and a couple of South American nations, was where much of the amethyst was mined in the old days. Kaisilver celebrates this spectacular gemstone in the MAN57AM men's amethyst ring. The MAN57 concept has been one of the best selling concepts for men's rings, the design was released more than a decade ago and was gradually copied and imitated across the globe. The ring features a large cushion cut amethyst gemstone set in a finely crafted gold or silver mount. The bezel set gemstone in this handsome men's ring offers a sturdy and protective gem mounting. Prongs are known to stick in pockets and fabrics, this causes them to get gradually pulled apart - this ultimately loosens the gemstone. We have therefore avoid the use of prongs in the design concept for this, men's amethyst gemstone ring. The MAN57AM is a fully custom made men's gold or 925 sterling silver ring with amethyst gemstone, the design, dimensions, gem selection and even the cut of the stone can be decided by you. Most jewelry lovers patronize fine high end jewelry providers like Kai Silver, to get quality, style and an exclusive loo - they have always found those elements in jewelry crafted by us. The color of amethyst can be broadly grouped into three categories, light (pale), medium and dark saturated purple, the amethyst ring for men is shown here with a dark purple amethyst gemstone. With our experience in gems and jewelry that extends to several decades, we would say that a dark amethyst should ideally not be darker than the stone shown in the image. While it is technically possible to procure a dark amethyst that is very much darker than the stone seen in the image, keep in mind that such a stone would show very little color in normal light conditions. Most men's amethyst gemstone rings are ordered with medium to dark purple gems, we would suggest that it is what you should request for too. Let us now talk about the cutting pattern and style for the gem in this impressive custom men's amethyst ring. Most jewelers would have preferred to have a simple, rectangular cut gem for the ring. The simple reason is that, it would be easy to procure such a gemstone from the market. Kaisilver with its direct access to over 200 million carats of cut and polished gems and preferential access, to quality gems from almost every mining location in the world - handpicks and custom cuts every gem before it is expertly set. We have lavished this amethyst man ring with a large cushion shaped amethyst, the face of the gem has multiple cuts and is rightly referred to as a checkerboard cutting pattern. While the meaning of custom cut means that, you get the finest cutting styles it also means that, you can choose the gem cut and style for your gold or 925 silver men's ring. You could choose the conventional faceted cut, a smooth cabochon cut or retain the checkerboard cut as shown in the image. Kaisilver maintains high standards for craftsmanship and gems irrespective of the metal selected by the buyer. This has brought us a quality conscious clientele that, appreciates quality and realizes that low prices always come with a compromise on quality. Men have always had a preference for sterling silver, they seem to like the confident but calm look and feel of the metal. Gold has a more lavish aura around it and some men seem to have reservations about that. The good news is that, we can fulfill requirements for bot metal options - and do that without compromising the quality of any features. We recommend that the mens silver amethyst ring be left un-plated mainly because, plating done on silver will always wear off after a while. If you still feel the need to have your men's silver ring plated, we offer options for white rhodium, yellow gold and pink gold. The amethyst gold ring for men can be ordered in 14k or 18k gold with, all three gold color options. It is generally accepted that, high end jewelry like those crafted at Kai Silver should maintain a minimum gold standard of 14k and this is why you will find price quotes for 14k and 18k gold on our web resources. Our support team can work on a price quote for 10k gold so do communicate your requirements with them. When you purchase a jewel, you expect to wear it for a long time. Add to it the fact, there is always some sentimental value that develops between you and the jewel and you know that, durability is important for your amethyst ring. And yet, very few jewelers are willing to discuss the durability of their jewels in detail mainly because, most of them don't really don't care once the purchase transaction is complete. At Kaisilver we give equal emphasis to style and durability - many features in the MAN57AM men's amethyst ring are included just to, make the ring strong and sturdy. The listed highlights of this amethyst ring for men, should give you a good idea of the quality features that are packed into this high end ring. Fine craftsmanship and handpicked gems for the gold and 925 silver men's ring. You can pick the gemstone of your choice, you are not limited by what you see on the website. Gemstone size is 11x9mm cushion and 10x8mm Octagonal - refer to price table. You can choose a faceted or a smooth cut (cabochon) stone for your ring. Healthy metal weight ensures that the ring retains shape and form without easily deforming. The metal weight for the men's gold ring is 20 to 25 grams. The 925 silver men's ring weighs around 18 to 22 grams. The portion behind the finger measures 6mm to 8mm, depending on the stone size. For the men's gold ring you can choose 14k or 18k, in yellow, white or rose gold. It is recommended that the silver ring be left un-plated because, all plating will wear off after while. If you prefer to plate your silver men's ring, we offer white rhodium, yellow gold or rose gold as options. The bezel set with metal all around the gem border, offers keeps the gem firmly mounted. The metal border of the gem also protects the stone from damage by side impact. As you can see from the price table shown above, the price of the amethyst men's ring is based on the choice of metal and gemstone. 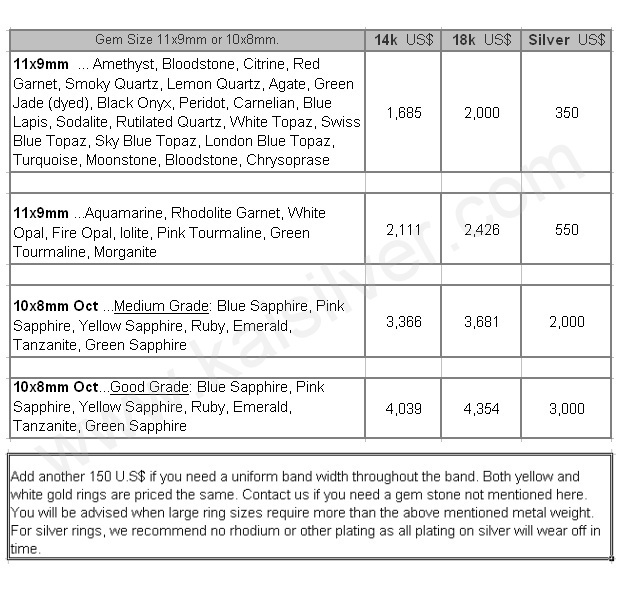 Please note that the gem sizes also differ based on the gemstone that you select. You can email our support experts for any further information and also if, you need any of the features for your ring to be personalized to suit your preference. How To Buy: You might have noticed that the' Kaisilver website, is not filled with the all too familiar 'Buy Now', 'Add To Shopping Cart' icons and instructions. We wish that you communicate all your requirements to our support team at sales@kaisilver.com , get as much information and details as you need. Once you feel comfortable to work with us for your requirements, move to the payment stage. You would have received a specific price quote based on your requirements from our team, payment can be made through Paypal or Western Union. We would would recommend Paypal for first time buyers but, the final choice is yours. Let us know the mode of payment that works for you and we will provide details for the same. There is a production time period which is generally around 4 to 6 weeks, you will be informed of this before you actually pay for the order and confirm it. Shipping is through FEDEX with web tracking and you will need to add an additional 35 U.S$ for the shipping charge to the prices mentioned in the table. You will be provided with the FEDEX tracking number the moment your merchandise ships. Kaisilver: We are the leading online custom jewelry provider from Thailand. Skilled craftsmen and expert gem cutters create each jewel with concentration and passion. Production experts and tight quality control measures ensure that, all jewelry is made to comply with the specifications agreed with the buyer. Over 20,000 jewelry lovers across the world trust us for all their high end jewelry requirements. Our commitment to quality for both gold and silver custom made jewelry, remains unmatched in the industry. With decades of experience in gem sourcing, we have direct access to over 200 million carats of gems and mining connections with sources across the globe. This allows us to an unlimited range of gem options to our buyers, you need not be limited to what you see on our website. We welcome design ideas from buyers and can, make just about any jewel that you fancy in gold or silver with gems of your choice. 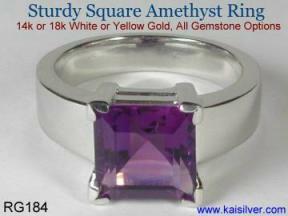 Another sturdy square amethyst ring for men, special 'L' type prongs are used to set the square amethyst gem firmly. This ring with it's bold contemporary design is sure to impress every style conscious male ... more. The four centuries old claddagh ring is regarded as history's most meaningful jewel. 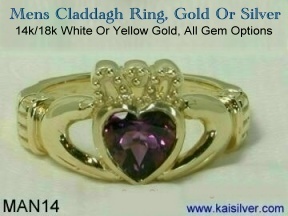 Kaisilver offers this classic jewel in gold or 925 sterling silver with all gem stone options. One of the few heart rings that are suitable for men ... more.